Introduction; Brief history of development; Some early schemes; Gas turbine developments; Steam generator concepts; The single shaft block; Repowering steam turbines; Combined heat and power; Gas turbines and coal; What does the future hold? Combined cycle technology is used to generate power at one of the highest levels of efficiency of conventional power plants. It does this through primary generation from a gas turbine coupled with secondary generation from a steam turbine powered by primary exhaust heat. Generating power at high efficiency thoroughly charts the development and implementation of this technology in power plants and looks to the future of the technology, noting the advantages of the most important technical features – including gas turbines, steam generator, combined heat and power and integrated gasification combined cycle (IGCC) – with their latest applications. 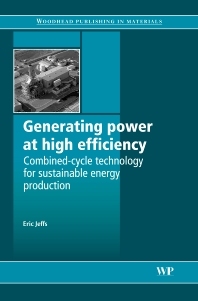 Eric Jeffs has written widely on a range of issues affecting the power industry, and from 1991 to 2005 was European Editor of Turbomachinery International.